Big news! Very soon, you'll be thrilling to my brand-new interview with writer Greg Pak, who is busy up to his eyeballs in work, but not so much he couldn't chat it up with me about one of his many new projects. In the meantime, here's the review that's been, well, a few hours in the making, at least. 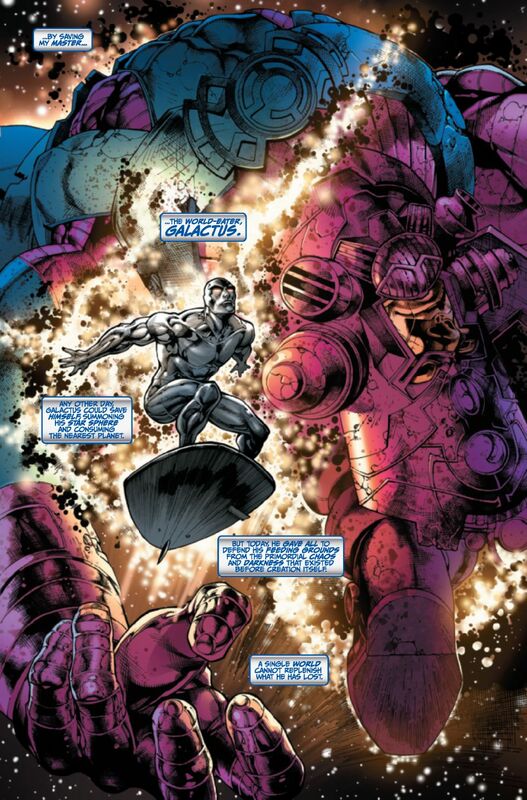 The Silver Surfer is one of Marvel Comics' most beloved heroes, rife with philosophical possibilities. After spending the first two decades of his creation marooned on Earth behind a barrier erected by his master, the planet-devouring Galactus, his adventures have spanned the cosmos entire. He's been a part of many crossover events, from Jim Starlin, George Perez and Ron Lim's Infinity Gauntlet (and its sequels, The Infinity War and The Infinity Crusade) to the Annihilation and Thanos Imperative series of more recent vintage. Most recently, he and his master helped save the whole universe from the Chaos King in Greg Pak, Fred Van Lente and Khoi Pham's epic Chaos War. In the aftermath, with Galactus depleted more than ever, the Surfer leaves him to heal in our Sun, and once more finds himself drawn toward the planet to which he'd previously been exiled. What surprises will await him there? Having heard what an enormous Silver Surfer fan writer Greg Pak was, I'd been aching to see him land this gig for some time. It's telling that when Pak first started writing that other, emerald-green hero he so adores, the first big-name guest-star he brought in was the Surfer (in Incredible Hulk #95, and later again in Skaar, Son of Hulk #7-10). In addition, as the former owner of a huge Silver Surfer collection myself, well, I may be a bit more critical than most. I love the character and nothing would make me happier than to see him headline a new, regular series. But first, he must survive a trial--in more ways than one. I'm quite pleased to say that upon first glance, Pak seems well-suited to telling tales of the alien Surfer. That's really what he is, too: an alien, an outsider, looking at humanity from another viewpoint, able to exist among them but never being one of them. Thanks to Galactus (and special kudos to Pak for bringing this point back to the surface), the Surfer is disconnected from the crippling emotions associated with leading his master to world after world upon which he would feed. He's also disconnected from humanity in that he does not possess our frailty, and in fact is possessed of incalculable power--power to rise above it all. Wisely, Pak involves the Surfer in a conflict between a young couple and a group of soldiers. The scene works to show the Surfer's benevolent personality even as Pak sets up the thrust of the entire arc with the arrival of a certain supervillain possessed of both amazing intellect and power. (And I don't have to tell you who it is if you've looked at the cover!) 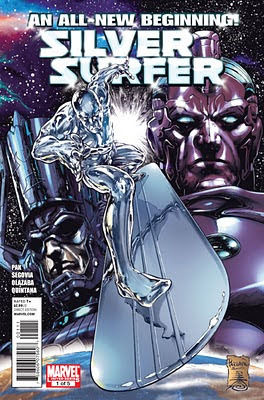 The Surfer and the villain have only met once before--back in the first Silver Surfer Annual--so it's going to be fascinating indeed how the two get on in future issues of this story. But if this issue's cliffhanger ending is any judge, I'd wager "not well." Relative newcomer Stephen Segovia handles the art chores for this issue, and sadly I can't lavish nearly the number of compliments on his work. Although the few action scenes are frenetic with detail, the story falls apart in the quieter moments. Segovia's faces and figure work don't look nearly natural enough. The High Evolutionary's arrival late in the story is especially problematic, with the perspective and relative sizes of the other characters making him look absolutely gigantic. Most troublesome of all was the final page, which should look dramatic with its cliffhanger, but thanks to some strange anatomy it doesn't quite sell the mood Pak was likely hoping for. I do hope the artwork improves in future issues, and with the arrival of Harvey Tolibao to divide up the labor beginning next month, I believe it will. So, what do we have in the latest first issue of the Silver Surfer? An intriguing start that rings true to the Surfer's world, brought to life with flourish by a creator who clearly loves the character. The art may not be perfect, but the story more than sells the book by itself. If you're a fan of cosmic-level superheroics, you could do a whole lot worse than checking out Greg Pak and Stephen Segovia's new adventure featuring the Sentinel of the Spaceways! Silver Surfer #1 is now on sale at comic shops everywhere for the low, low price of $2.99 USD. To find a store near you, call 1-888-COMIC-BOOK or visit http://www.comicshoplocator.com. A great start for Pak's Silver Surfer series. I just hope it sells well enough that we get more issues of our favorite Herald of Galactus. As for Greg Pak's Incredible Hulks... well, I hope we get something epic. I hope Pak gives us something that will be epic in scale. Could it be something involving Hulk and the Gods? Could Gaia declare Hulk as her champion, thus bestowing power to the green goliath, and in a fit of rage and payback, Hulk goes for a rematch against Zeus and the Olympians and defeats them all? We can only hope and see what Pak will give us. I just want a storyline that, like World War Hulk & Planet Hulk, proves that Hulk is indeed the Strongest One There Is mongst both mortals and immortals. Planet Savage looks very promising, but for the Mr. & Mrs. Hulk Super Spy storyline... I don't know. It looks kinda 50/50 on if it'll be good or not, but I'll check it out. Until then, I hope we see more great issues following the Silver Surfer. Another favourite character of mine. I too have highhopes for this series and hope that it does well enough to last more than a couple of issues.